Honda's full-featured, dual stage, track drive HSS928CTD snowblower features technologies for performance, ease-of-use and durability. Powered by the latest Honda GX270T2 commercial grade OHV (overhead valve) engine, the HSS928CTD clears a path 71 cm (28 in.) wide and 55.0 cm (21.7 in) high, and moves up to 52 metric tons (57 tons) of snow per hour with a discharge distance up to 16 metres (52.5 ft.). And it provides the ultimate in snow clearing convenience: Turn the key and go with 12 VDC on-board battery start, and control the height and direction of snow discharge with the touch of a finger using the convenient remote electric two-step chute with "Joystick" control. Should unwanted debris cause the auger to lock during operation, a Shear bolt Guard System alerts the operator and automatically stops the engine, preventing mechanical damage and unnecessary down-time. A standard hour meter monitors usage and helps to ensure that proper maintenance is carried out in order to keep the HSS928CTD running smoothly and at peak performance. The variable speed hydrostatic transmission features a single lever for quick switching between forward and reverse, and for accurate adjustment of ground speed without affecting auger rotation speed, while the steering assist drive system improves manoeuvrability with or without engine running with the new fingertip trigger steering control allowing precise turns for unmatched on-the-fly steering. 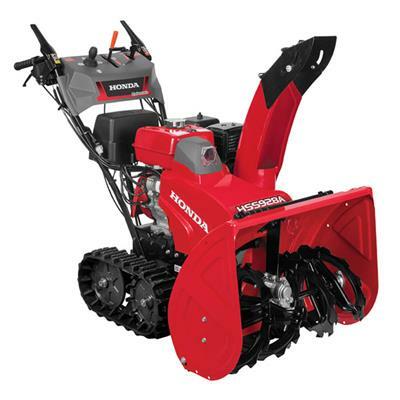 The hydraulic-assist auger height adjustment control allows on-the-fly adjustment of auger height for optimum performance in varying snow conditions. It comes with a 3 year residential/commercial warranty, it's certified to meet or exceed EPA emissions guidelines, it's highly operator-friendly, and the HSS928CTD has the power and the technology to clear heavy snow from large areas and a variety of surfaces. Easy, reliable starts in any weather condition with automatic decompression system and electronic ignition.